On December 2nd, 2013, Anthony Bartolo published this sweet and simple guide to activating disk performance counters here, also pictured below. This diskperf function goes back to Windows NT in 1995. Because of the slight overhead imposed by turning on these counters, Windows Server variants shipped with these counters turned off. Flash forward to today, and you'll notice that even in Windows Server 2012 R2 Essentials, the disk performance view in Task Manager is off by default. See also my new 2 minute video below, to see just how easy it is to turn them on, and how nifty it is to see a live view of all your drives through Task Manager again! 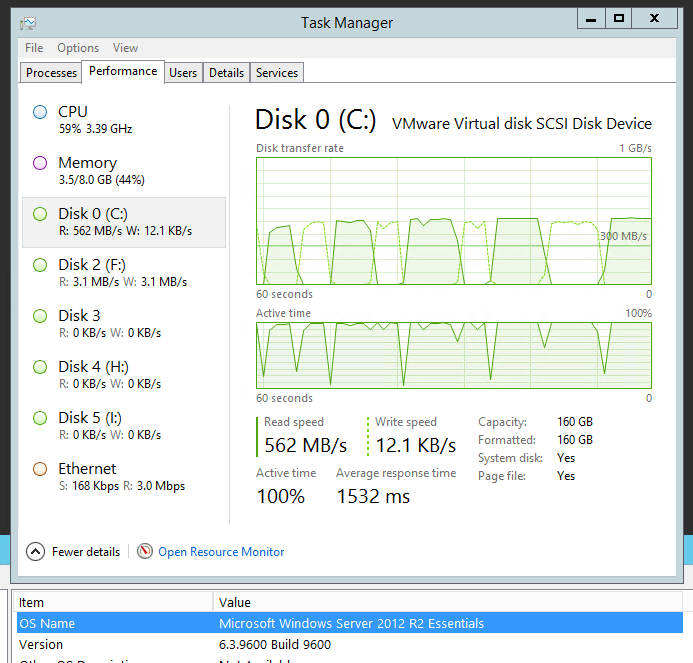 Step-By-Step: Enabling Disk Performance Counters in Windows Server 2012 R2 Task Manager by Anthony Bartolo on 2 Dec 2013. A few notes on using Perfmon and disks: You can't use the PhysicalDisk object until you open a command line, enter diskperf -y, and then reboot your system. Until you do, all the PhysicalDisk information will come up blank. If you're going to log disk information, set the log interval to 60 seconds, or, again, it won't work--it's a bug in Perfmon.